My towel rack with Paulette Adams handmade ceramic cup, old Ralph Lauren crystal perfume bottles, a darling canning jar candle from The Vintage Market Place and yes Little Bo Peep and her lost little sheep. She's old but fit right in with the colors. I made this mirror about 10 yrs ago and still love it. Time to paint the 80's oak cabinet! 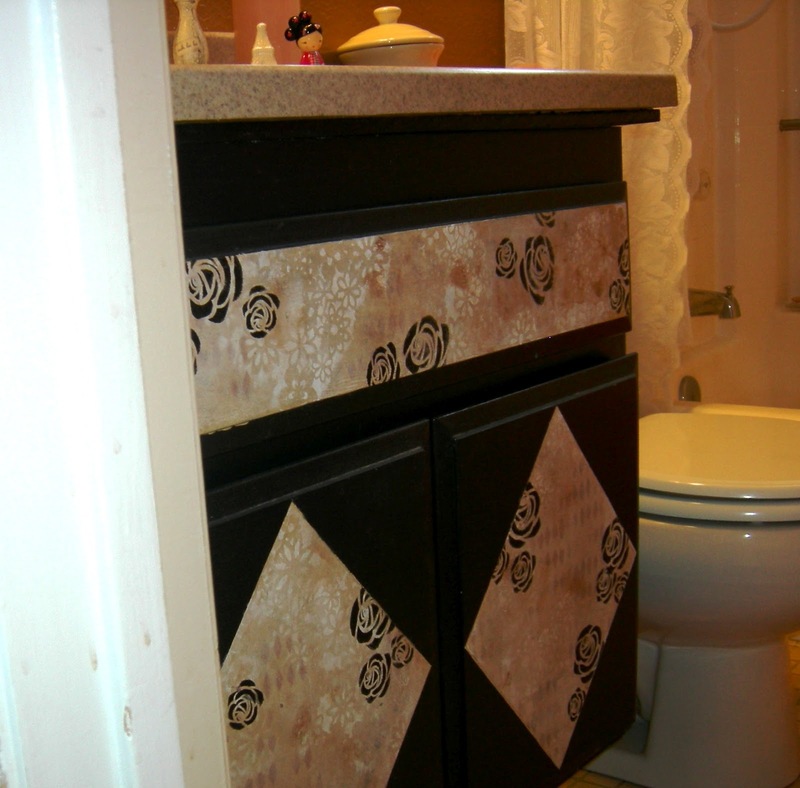 The rose stencil is from Creative Imaginations. I still need to put the glass knobs on. 2 mirrors are better than one, especially if it's a track house mirror! The one on the left has some old talc shakers from the 70's. Do you remember Tigress? A reproduction vintage ruler looked good here. The mirror on the right has toiletries from the Hotel Santa Maria Novella in Florence, A little reminder of our 25th anniversary trip. The perfect bouquet, I rescued from the trash! An old display prop from my retail days. Every bathroom needs a harajuku girl, don't you think? Especially if she's dressed in pink! At last...my girlie bath. My son moved out last summer and I've been wanting to turn his small bathroom into my little girlie bath where I could just soak in all that girlie goodness. Now, I've never considered myself a pink person, but pink just seemed to take on a life of its own as I started adding things to it. I started with painting the walls a deep caramel. At that point I had no idea what my accent color would be. Besides the mirrors and faucet, I didn't buy anything new for this redo. I simply shopped from the rest of the house. Pink kept creeping its way in so I gave in and bought pink towels and rug. Why fight a good thing? 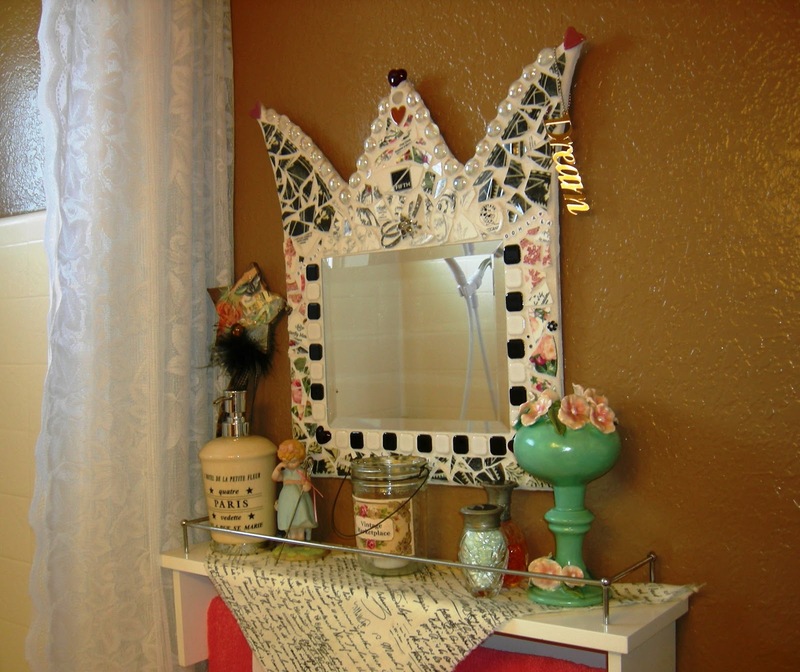 Especially your mosaic crown mirror frame, fit for a princess. Thank you, I feel so honored that you included me ceramic creation in all the girliness! Love it Julie! Sorry I missed you at GLitterfest. Hope to see you soon!!! Your email made my day, probably my week and I'm having a pretty good one so far. Thank you Cathy! the whole while my family was doing just fine. We put so much stress on ourselves in this world today. one can take the leap while working. Leap, girl! You were given gifts that are meant to be shared! 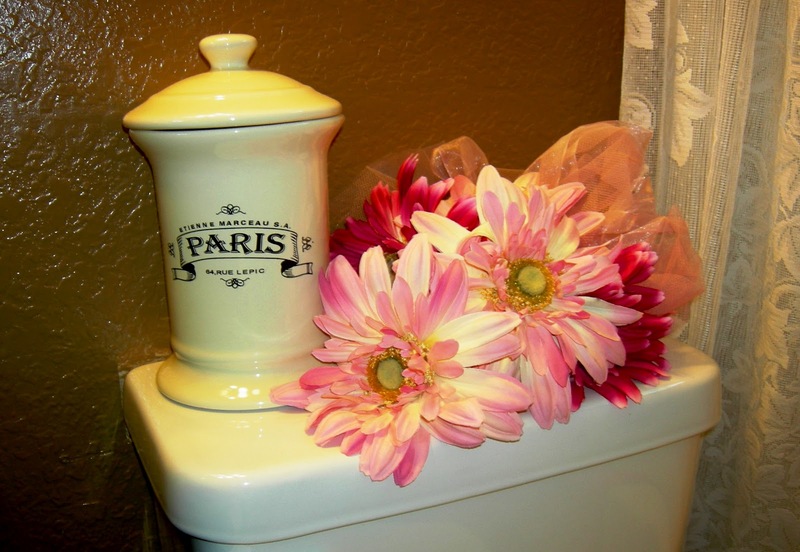 Hey Julie: Love your girlie bathroom. 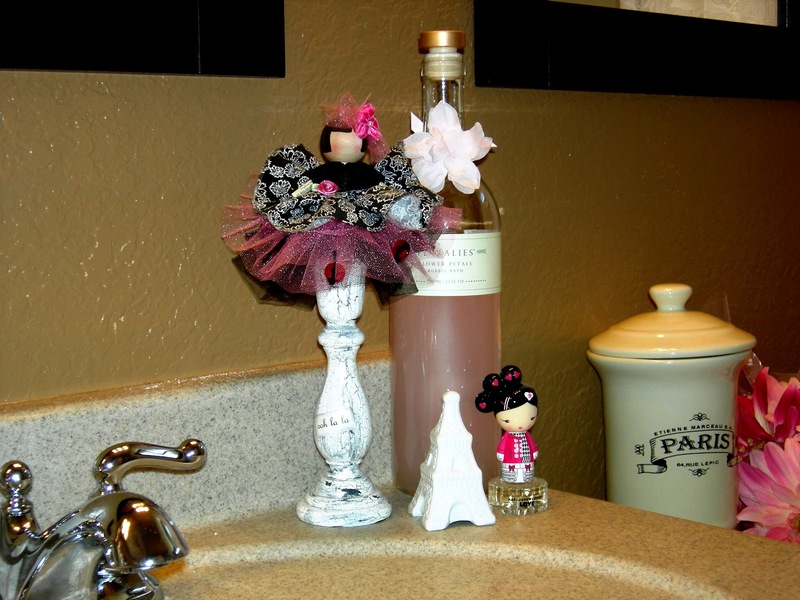 Adding pink gives it a nice touch of feminine color. The crown-shaped mirror you made is neat. 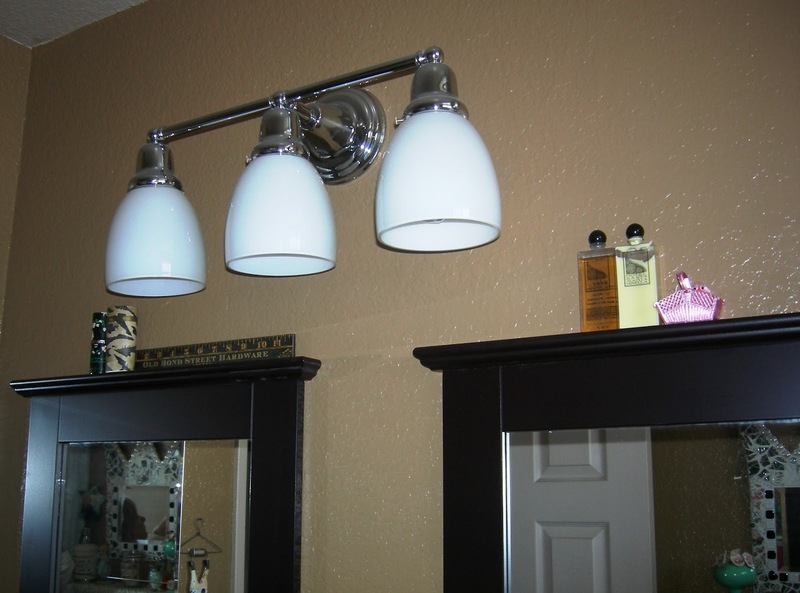 I am impressed by a makeover that comes from what we already have around us . . . my favorite way of decorating! Hope to see you at the next Glitterfest.